At a Monday meeting in Boston of the governing board of MassTech Collaborative’s Innovation Institute, industry leaders talked about what’s working with the state’s vast programs and services for entrepreneurs, what could be done better, and how significant the services are to the broader economy. 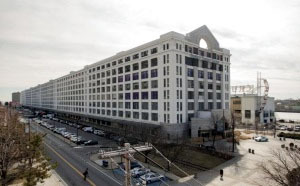 Massachusetts is already home to several “collaborative workspaces” for entrepreneurs, ranging from co-working spaces such as WeWork to makerspaces such as Arisan’s Asylum in Somerville, to incubators such as Greentown Labs in Somerville and accelerators such as Boston-based MassChallenge. 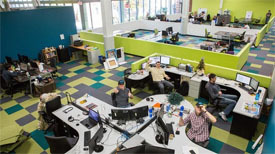 The MassTech Collaborative’s 2015 “Innovation Index” found that there are about 33 co-working spaces, 25 makerspaces, 26 incubator programs and 15 accelerator programs in Massachusetts. Why do Liberty Mutual, Silicon Valley Bank (Nasdaq: SIVB) and IBM (NYSE: IBM), Comcast (Nasdaq: CMCSA) and Constant Contact (Nasdaq: CTCT) take temporary office space form providers like Work Bar and WeWork? In short, management wants certain aspects of these business to think like a startup and not like a lumbering giant. Liberty Mutual’s entrance into WeWork this fall coincided with the launch of the Solaria team. The incubator has a broad mandate: developing new products and services with “transformational potential,” that may or may not have anything to do with insurance. At the moment, the company has two offices in WeWork that can fit a combined 32 people. Right now, the rooms are home to about a dozen Liberty Mutual employees and members of two startups, end-of-life planning company Cake and drone maker Xactsense. Liberty Mutual offers the companies free space, as well as human resources and other types of support, while the startups offer advice and connections in two areas of keen interest to the insurer. What would it be like to leave your office and work at WeWork? 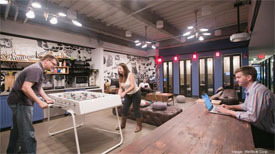 WeWork is an American company which provides shared workspace, community, and services for entrepreneurs, freelancers, startups and small businesses. WeWork designs and builds physical and virtual communities in which entrepreneurs share space and office services and have the opportunity to work together. The company’s 30,000+ members have access to health insurance, an internal social network, social events and workshops, and an annual summer retreat. 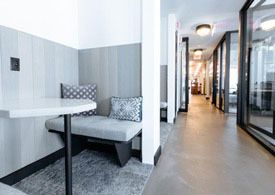 WeWork is one of many companies in the Boston area that offer co-working space for the city’s burgeoning startup scene, including Worklab, Coalition, and the Cambridge Innovation Center. While its membership prices are on the costly end, ranging from $45 a month to more than $450 a month per desk, the price is not a deterrent for entrepreneurs. For a relatively modest cost, entrepreneurs say they get a ready-made office space complete with a sense of community, an internal social network and the enriching and collaborative startup culture that prospective employees want when they sign on to work for a startup. Have a peek at how some of the shared workspace providers manage users and spaces locally and worldwide. 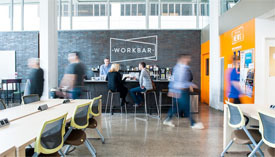 A BetaBoston article notes, “over the past several months, Workbar has partnered with Fields Corner Business Lab and five other regional co-working spaces to create the Workbar Network, which will link these independently run facilities into a larger community. Other participating sites are Work Station in Cohasset, The Entrepreneur Innovation Center at Framingham State University, Running Start in Worcester, and Groundwork! in New Bedford…As part of the network, these six sites are now using Workbar’s proprietary software to help manage their members, Cole says. The software provides tools for managers to check people in, coordinate conference room bookings, and promote events and happenings throughout the network at large. 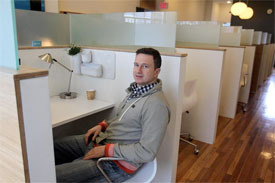 “It’s everything they need to run the space,” says Devin Cole, Workbar’s director of business development. You can read the full BetaBoston article on its website, here. Who are the newest inductees into MassChallenge? Have a look. Jump over to the BizJournals.com website to see the complete list of all 128 startups accepted to the accelerator program. I was first introduced to Breather from Will Preap who is the head of Breather’s business development for Boston and got the concept. The notion that I could have a private meeting/interview in a space outside of the public eye was captivating. Preap has strong roots to Boston and expects to add 30 location throughout the CBD. So, questions I get from landlords are, is it safe? Yes, Breather controls access to the space via a smart phone app. Prior to getting access, Breather understands the clients social footprint using algorithms that access social media sites to better understand the profile. Once you have selected the Breather spot you get to the door and Breather provides a one-time access code to the app. You enter and you meeting commences. The space is fitted out with smart phone chargers wrapped in a sophisticated yet relaxed atmosphere complete with WIFI. The meeting ends and you depart, yes, Breather knows. Breather then sends their team back into the space to ensure it is ready to go for the next client. Pictured above is Justin Harlow of BRA’s Downtown team @ 715 Boylston Street. What types of business use shared workspaces? Well, the cofounder of b.good is an avid user of Oficio on Newbury Street. “Jon Olinto, cofounder of the restaurant chain b.good and [his] b.good cofounder Anthony Ackil, his childhood best friend, hold job interviews and meetings in conference rooms at Oficio, which runs two shared office spaces on Newbury Street. About 350 entrepreneurs and companies rent space at Oficio, paying anywhere from $69 a month to use the mailing address to $2,300 a month for a dedicated office for a team of eight workers, with 24/7 access. Oficio provides lunch about once a week, hosts networking events, and schedules guest speakers, such as accountants, to talk about the basics of running a business,” according to a Boston Globe article. You can read the full Globe article, here. Alternatively, you can use our resources for more information on shared workspaces in Boston. 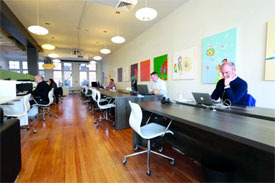 0	Looking for Coworking Office Space in Back Bay? Not ready for prime time space, but ready to get out of the garage? The Back Bay submarket appeals to a wide variety of firms for a number of reasons. Access to transportation, an educated vast work force, and a large concentration of employers in a small area all contribute to this submarket’s popularity among Boston office space users. Unfamiliar with the area? 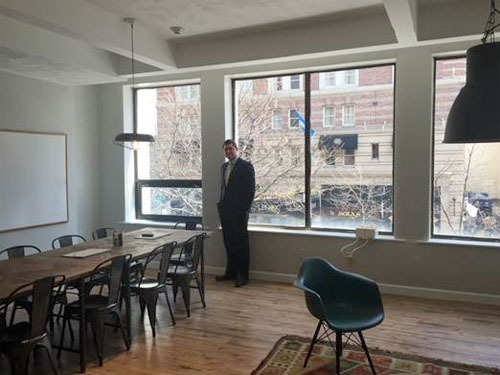 Read our submarket page to learn more about Back Bay Office Space.